Discussions are pretty straightforward. You and your students leave posts—both comments and replies—and can even attach files to them. 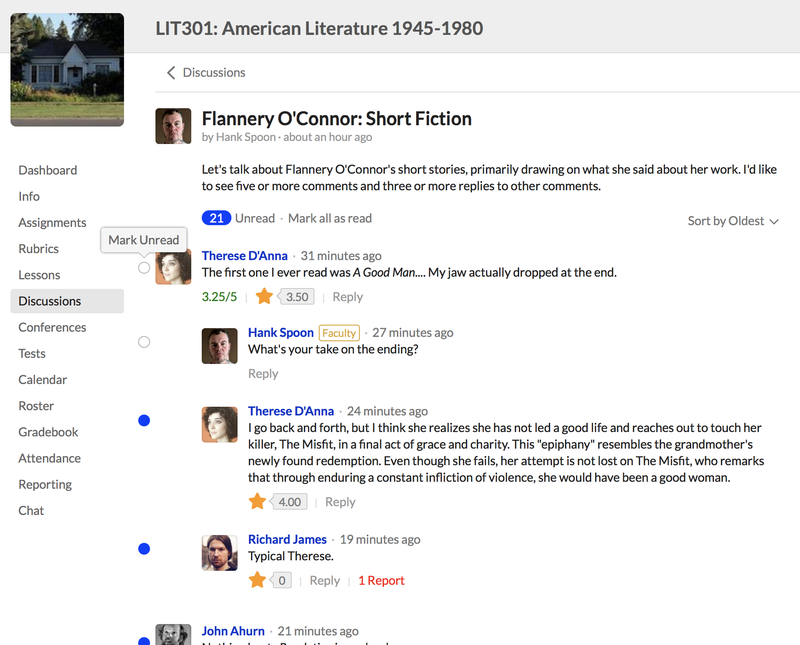 You and your students can comment, reply to comments, and reply to other replies. Anyone who starts a discussion can delete it. Users can also delete their own comments and replies. Course instructors and the registrar can delete any discussion, comment, or reply. The blue circle indicates an unread comment. A gray circle indicates a read comment. Click the circle to toggle it to the other status. Use the filter to sort the discussion by Oldest/Newest, Unread posts, those with Recent activity, or those with the most activity (a comment with a lot of replies, for example). Peer rating lets your students rate one another's comments and replies. In graded discussions, you can make peer rating one of your grading requirements. 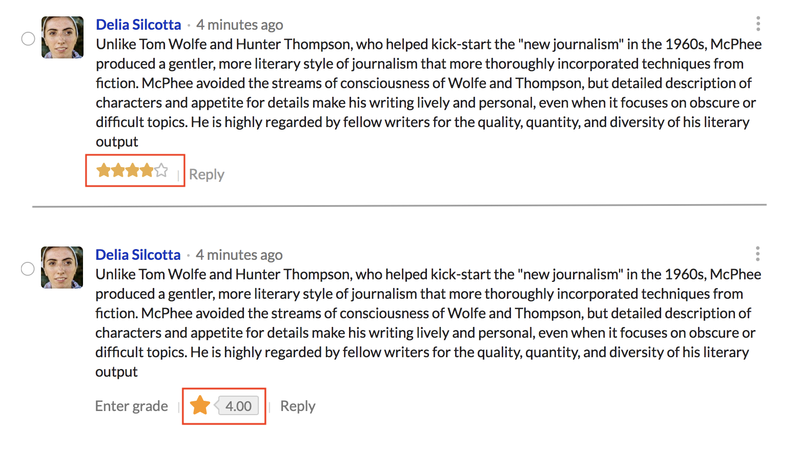 In the image below, the top part shows you what the student sees: one to five stars with which to rate the comment. The bottom part shows you what you'll see: an average of all the ratings on this comment. Students can report other students' inappropriate comments, replies, and even entire discussions. This article describes how that works. Graded discussions give you the option of grading individual comments and replies from students. These comment grades can then be used as a grading requirement for the whole discussion. This article describes how to grade comments, replies, and discussions. Is there any way of measuring student participation in discussions? Even a simple option like pulling a report of all a students comments within a course, or across all courses. Some of our profs added an 'online participation' component to their classes, but to gauge how much students engaged, they basically have to go through each discussion and manually measure a student's participation. Have you checked out the Performance Dashboard in the course's reporting tab? It measures student participation in discussions—perhaps not exactly the way you mention here, but it definitely comes close. That will definitely help. I went to the dashboard, but didn't look at the report on a specific student. Thanks Brendan! I notice that Populi has incorporated some aspects that are traditionally connected to social media sites. For example, you can “like” or heart someone’s post. Is there a way to tag a student in a discussion post, such as (@Howell, Ginger)? Our instructors want to make sure that their reply gets seen by certain students.